Third base coach, Rich Donnelly actually picked Barbaro a month ago. Not too shabby. POINT DETERMINED – Aaron Sele went to Triple-A Las Vegas at the end of Spring Training, determined to make his case for the starting rotation and he will get the chance to do so tomorrow, as he will replace Odalis Perez in the rotation. The Dodgers placed Perez on the bereavement list, as he has returned home to the Dominican Republic to be with his ailing mother. To make room for Sele on the 40-man roster, the club moved Yhency Brazoban (Tommy John surgery) to the 60-day DL. DERBY DAY FINDS PENNY IN WINNER’S CIRCLE – Dodger starter Brad Penny, who owns six thoroughbreds and follows horse racing closely, takes to the mound on the night of the 132nd Kentucky Derby. Yesterday, Penny got the chance to see his horse, Excess Temptations, run to victory at Hollywood Park. 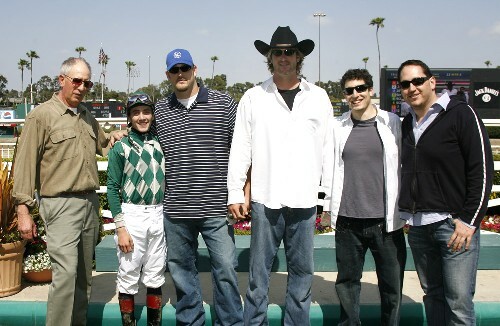 Penny was joined by teammate “Brother Derek” Lowe and "American Pie" actor Jason Biggs (second from right). CAUSE TO BELIEVE – With last night’s win, the Dodgers have defeated the Brewers in 23 of their last 31 games dating back to 2001. Los Angeles has not lost a season series to Milwaukee since 2000, went they went 3-4. SHARP HUMOR – Nomar Garciaparra helped celebrate his heritage on Cinco de Mayo yesterday, as he warmed up in a Mexican poncho during pregame and proceeded to get two hits. FLASHY BULL – Dodger reliever Jonathan Broxton, nicknamed “The Bull,” has made three appearances this season and has not allowed a run, striking out four in 2.1 innings. well, i hope that nomars good luck poncho can start a winning streak, and i have a feeling brad penny might pitch a gem today.. i have a feeling a no-hitter might be up his sleeve, i hope i dont jinx him.. well josh, do u have any news on greg miller?.. i am hoping he can be up with the dodgers this year… well lets win today.. I think it’s called a Serape, if your from South-America it’s an Poncho. but I could be wrong. I think Vin Scully called it a Dodger Serape. Was checking on Jacksonville stats this evening. Greg Miller doing quite well in relief. ERA 1.00 IP 18 H 6 BB 9 K 17 WHIP 0.83 Saves 1 Holds 2 Also hope he has recovered from his arm problems and makes it to the big time at some time in the next couple of years. Let’s see how good an indicator playing in AAA is of pitching ability in the majors for a veteran.